Details : Ht 26" TET. Ev. Med. Re. Bl5.5"
Lovely pink self with a lime-green throat. Pencil thin gold edging on petals. Pale pink sepals. Details : Ht 26" TET Med. Re. Bl 5.5"
Very rounded and ruffled cream blooms. Green throat. Fragrant Quality blooms. Creamy orange bloom with a large mahogany eye. Creped and ruffled. Vigorous and a real show-off in the garden. A very crisp neat looking bloom of clear creamy almond with a blush of rouge and a dark purple-burgundy eye with matching ruffled edge. Citron throat. Details : Ht 26" TET. Dor. M. Re. Bl.4 - 5"
Petals are rose with cream ruffled edges & the sepals are cream with a pink blush.A miniature variety and goes dormant in winter. Details : Ht 26" TET. Ev. M-L. Re. Bl. 6"
A red - coral bloom with a darker eye. Prominent cream-gold sharks toothed edge around the petal edges. Green throat. Details : Ht 26" Ev.Tet. E. Re. Bl 4"
Details : Ht 30"DIP. Ev. 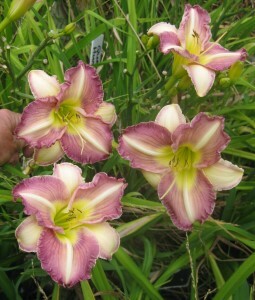 M. Bl 7"
Large creamy triangular blooms that have rosey edges on the tips of the ruffled petals. Unusual and pretty! Limited stock - 1 per customer. Details : Ht 24" TET. Ev. M Re Bl 5.5"
Royal lavender purple with a lighter lavender edge and eye. popular. Limited stock. Details : Ht 30" TET Ev. EM Re. 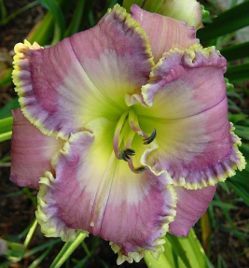 Bl 6"
Mauve-purple with a ruffled, silver-lavender edge and a green throat. Details : Ht 28" TET. Ev. Re. Bl 6.5"
Dark pink with pale edging. Lime throat. Prolific and Hardy. High bud count. A great performer. Details : Ht 24" TET. SEv. M-L. Re. Bl 4.½"
Smallish blooms of pale ivory pink with a rose pink eye. Loads of blooms. Vigorous. Limited stock. Details : Ht 28" TET. SEv. E-M. Re. Bl 6"
Bright coral rose with a very ruffled edge of cream and gold. Blooms are full, round and overlapped and of heavy substance. Great bud count. Limited stock - 1 per customer. Details : 30" SEv. Tet. M - L. Re. 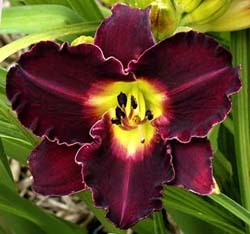 Bl 5.5"
An extremely dark, ruffled plush black-purple with a bright green throat. Substance is velvety. Holds well in the sun. Hardy and vigorous. A strong bug grower with fans the size of large leaks. Details : 20" Ev. Tet. M. Re. Bl. 5"
A stunning black-red with a burgundy watermark. Full, round blooms are nicley ruffled. Limited stock - 1 per customer. Details : 24" Tet. SEv. Re. Bl 5.5"
Details : Ht 30" TET. Ev. Re. Bl 6.5"
Details : Ht 35" TET Eve. E. Bl 4.5"
Light cream with a blue eye and fuchsia rings above a green throat. Limited stock - 1 per customer. Details : Ht 24" TET. SEv. E-M Re. Bl 5.½"
Gorgeous large blooms of lavender pink with cream midribs and cream crinkled ruffled edges. Blooms opne wide and put on a lovely display. Rose pink with a dramatic maroon eye and thick matching edge with a cream bubbly hooked outer edge. Texture has some crepeing, rounded blooms of great substance. Vigourous and showy. Details : Ht 28" Ev. TET. Mid. Bl 6"
A near white with purple eye and picotee edge, above a green throat. Limited stock - 1 per customer. Details : Ht 28" TET. Ev. 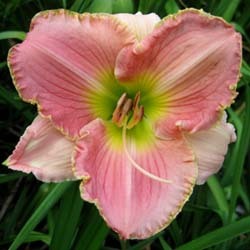 M. Re Bl 6"
Large bright red blooms with a paler watermark eye above a green throat. Large pale gold ruffled edging. Details : Ht 28" TET. Ev. E Re. Bl 7.5"
Pastel white blend with a ruffled gold edge, hoops and ruffles and a green throat. Limited stock - 1 per customer. Details : Ht 24" TET. S.Ev E-M Re. Bl- 5.2"
Cream peach with rose eye, yellow-green throat and heavily "braided" rose edge, which completely surrounds the petals. It's a great performer with well-branched scapes and 35 buds. Limited stock - 1 per customer. Details : Ht 26" TET. EM. S.Ev Re Bl: 5.5"
Rosy-mauve with blue violet watermark and double edge of blue-violet and citron yellow above a green throat. Details : Ht 28" TET. SEv. M Re. Bl 6.25"
Coral pink with a red eye. Limited stock - 1 per customer. Details : Ht 30" TET. Med Re Bl.6"
Orangey bronze with a deep red eye on tall scapes. 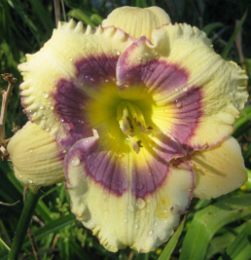 My most tan/brown toned daylily, unique nice colour. Details : 18" SEv Dip. E-M-L Re. 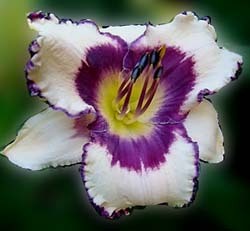 Bl 7"
A bi-colour bloom with pink lavender ruffled petals with white midribs and white sepals with pink edgings. Very pretty and prolific.